Be surrounded by the sights, smells and sounds of a working sari shop in Rusholme's Curry Mile in this unique theatre experience. Rajesh and his mother face a crisis in their business – with Rajesh committed to creating unique, handcrafted saris, and his mother wanting to explore mass production. Can they find a way to preserve the rich tradition of the sari? 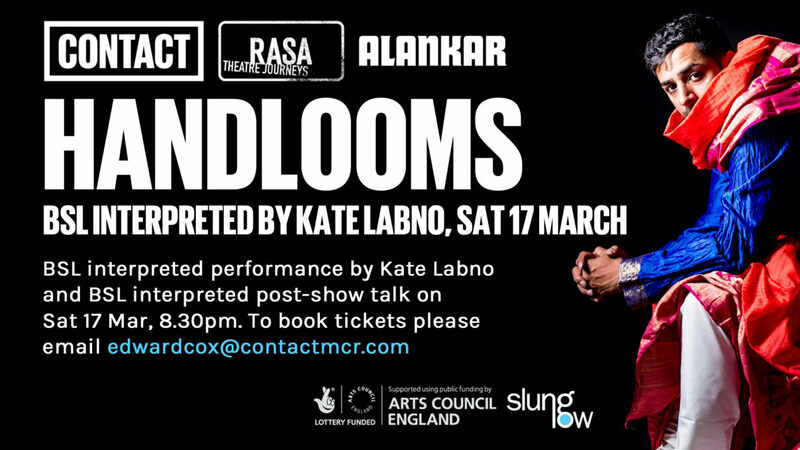 Challenging simplistic and stereotypical assumptions about an aspect of migrant life – the sari – Handlooms is an exciting and immersive theatre experience for a small number of audience members per show. Advance booking is highly recommended due to limited capacity. If you have booked your tickets already, please click here for important information about your booking. Please note: We have a limited number of tickets still available for BSL audiences, please email edwardcox@contactmcr.com for further details. Headsets are issued as part of the performance. If this impacts on your experience, please do get in touch with us. BSL interpreted performance and post show discussion on 17 March.